Very little left until spring. Of course, we all would like to know what will be the forecast for the spring of the year? Early or will come with a big delay? Few people recently believe the forecasts of meteorologists, because they are so often wrong! Let us trust in the old-fashioned methods of determining the weather and see what the folk signs say about the arrival of spring. As a rule, our ancestors learned about the weather in the spring on church holidays. It was on such days that predictions were made for the subsequent winter and the arrival of spring. Frosty weather at Christmas and Christmas time — this is a good sign. According to this belief, spring promised to be warm and early. If during the Christmas holidays there is a thaw or a blizzard, then the spring will be cold and will come very late. At Baptism (January 19) the full moon is to be damp spring. This means that the snow will quickly melt, and a large flood is formed. A clear day for baptism is a bad sign, meaning that the snow will not leave the fields for a long time. In the Old New Year, you can also predict the weather in the spring. If on the night of January 14 the wind will blow from the south, then spring will be warm. If the wind blows from the north — spring will be windy and cold. If Fedosia is warm (January 24), then spring will be warm. If the snow — spring is expected to be rainy and overcast. On Tatiana’s Day (January 25), the weather is clear — spring will come early. 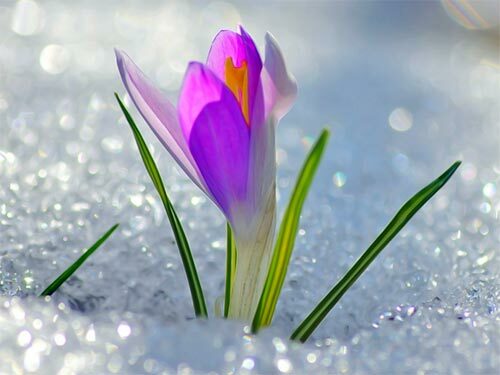 If snow fell on this day — wait for a rainy spring. On Makaryev day (February 1) sunny weather — spring will be early. What the weather will be on Sretenye (February 15), this will be spring. Also on this day, you can find out when the first thaw comes. If February 15 is warm, then in March most of the snow will come down. Cold and frost at Sretenye means late and cold spring. There are also folk signs associated with the behavior of animals, birds and changes in nature. By these signs, you can also find out what the spring will be. If a cat hides its nose in winter weather and chooses the warmest place in the house for sleeping, then spring will not come soon. This indicates that March will be snowy and frosty. If the rooks arrived early, then the spring will be early and warm. If in February long icicles — expect a large flood. Spring will come quickly and melt the snow in a few days. If at the end of winter birds chirp outside the window in the mornings, spring will be cold and snowy. If it rains in February, the spring will be wet. If the weather is clear and warm, then spring will be the same. There is a sign about the weather, according to which, the last day of February predicts what will be spring. If this day is cold, then spring will be cold. If blizzard is blowing, expect a rainy spring. If the fog — will flood. If the wind is strong, then spring will be windy. Folk omens are a great way to know the weather in the spring. It was not by chance that our ancestors followed beliefs, since all knowledge about nature and weather conditions developed through long observations. Previously, people were much closer to nature and it was much easier for them to catch every change. And today we have forgotten how to read the signs of the universe.